Cape Town - Reading between the lines, it seems as though South Africa intend entering the short Test series against the touring New Zealanders at Newlands over New Year with a seven-strong specialist batting line-up. That was the formula they employed throughout the triumphant, successive away series against England and Australia so, on the face of it, it is a policy hard to quibble with - the Proteas stand tall as No 1-ranked side in the world at present. Under the Gary Kirsten coaching regime, stability in team selection and a firm philosophy of truly investing in players (though the noisy pro-Thami Tsolekile lobby might argue otherwise?) have been key hallmarks. And there is a forceful case, thus, for arguing that there is little need to fix something that “ain’t broke”. Against that backdrop, expect the South African XI to look like this for the first Test on Wednesday: Graeme Smith (capt), Alviro Petersen, Hashim Amla, Jacques Kallis, AB de Villiers, Dean Elgar, Faf du Plessis, Robin Peterson, Vernon Philander (if passed fit), Dale Steyn, Morne Morkel. Should Philander’s hamstring injury not correct itself sufficiently, Cape Cobras team-mate Rory Kleinveldt will simply take his spot. At a short media briefing on Friday, Kirsten again enthused over the “uniqueness in international cricket” of the Proteas being able to boast seven frontline batsmen, due to the effective presence of two all-rounders in the top five in Kallis and De Villiers. The inference appeared to be that Elgar, the 25-year-old left-hander who got an unfortunate pair on debut against Australia in Perth - albeit in a Test- and series-winning cause - will get a reprieve for Newlands and probably stay at No 6, just ahead of the in-form Faf du Plessis at seven. But if Philander does get the green light to play, isn’t there a case, considering the rather obvious limitations of the Black Caps, for the Proteas to instead contemplate fielding both Philander and Kleinveldt and have an even better chance of assurance that they can do the all-important 20-wickets job in the Test? South Africa’s juggernaut batting line-up twice, even if the pitch throws up some unlikely quirks. 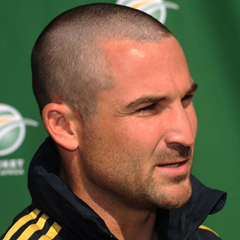 A personal long-range preference, therefore, is for the Proteas to station Du Plessis at six, still giving them an awesome array of specialists at the crease, and then assemble a credible enough tail comprising Peterson at seven and Philander at eight, and Nos 9-11 being Messrs Kleinveldt, Steyn and Morkel. That combination would greatly lessen the onus on veteran Kallis to bowl - remember that he is still inching back toward best fitness in that capacity even as we speak - leaving him only more empowered to go about his business of scoring heavily at a treasured venue where he has always had such stirring success in the past. My suspicion is that, given the reasonably likely level of imbalance in the contest, either or both of Elgar and Du Plessis may find themselves well-nigh superfluous presences in this particular Test match. Let me place spiritedly on record that I am all for Elgar, who has been a consistently weighty performer on the first-class scene in recent seasons and also shone brightly for SA ‘A’, getting further chances to confirm his worth and not being damned by one penniless performance statistically in the harsh environment of Australia. But he is also a player much more accustomed to duty nearer the front of the order, “assembling” an innings rather than pushing on vigorously in the middle. A satisfactory enough assurance for him at this stage might be that he is designated next in line if one of the top three, say, gets crocked.